A resupinate flower is one in which the flowerstalk does a 180-degree twist while it develops, bringing what would be the bottom of the flower to the top, and vice versa. Why would a plant do that? For an answer, let's look at a diagram. If it were an advantage to the plant to have a single lobe upward (the S petal) or a double lobe below (the two Q petals), this could be accomplished by resupination. One interesting aspect of resupination is handedness. The upside down flower can be brought about by a left-hand 180 degree twist or a right-hand 180 degree twist. One would expect the handedness to be the same within a given group. Sinningia cooperi normally has resupinate flowers. The stems hang, so the flowers would be upside down if they didn't do the twist. However, this resupination is not obligatory. If the stems are upright, doing the twist would make the flowers upside down again, so they retain the normal position. This can be seen in the picture of a nonresupinate Sinningia cooperi. We can conclude that the flowers use gravity to orient themselves. Sinningia sellovii has resupinate flowers, even though the resupination is not obvious, because the flowers hang vertically. There is a full discussion on the S. sellovii page. The best example of resupination is in the orchid family. All branches of this family have species with resupinate flowers, so resupination was almost certainly present from the beginning in this family, in order to create the unique orchid arrangement of floral parts. Orchids have flower parts in threes, however, so the diagram looks a little different. The S petal in the resupinate forms (which is most orchids) is the characteristic lip or landing pad or insect imitator -- the petal from which the uniqueness of orchids derives. It's not hard to see why an orchid flower would benefit from having its unpaired petal at the lower end of the structure. Resupination occurs in some gesneriad species too, but they are scattered around the family, and are not characteristic of any groups above the species level. Nematanthus striatus, for example, has resupinate flowers. The half twist brings the pouch to the upper side of the flower. It can be detected by noticing that the unpaired corolla lobe is at the top, rather than the bottom as is the rule for nonresupinate gesneriad flowers. Thinking about it a little more, I realized that galeate columneas, for instance, must practice resupination too; otherwise flowers from hanging stems would be upside down. The orchid family has another twist on the twist. Some species of Malaxis have nonresupinate flowers, but the nonresupination is achieved by a 360 rotation of the pedicel. During the evolution of these species, it was apparently easier to undo the resupination by over-rotating than by suppressing the rotation. One is tempted to make a comment about intelligent design here, but one is stifling oneself. According to Mabberley's Plant-Book, all lobelias have resupinate flowers. The picture to the left shows Lobelia speciosa. But wait a second! It's got the standard two-up-three-down arrangement seen in non-resupinate gesneriads. What's going on? It turns out that in the family Campanulaceae, to which Lobelia belongs, the flowers are regularly three-up-two-down. In order to get their flowers into the more conventional arrangement, lobelias have to flip them. But that isn't quite the end of the story. 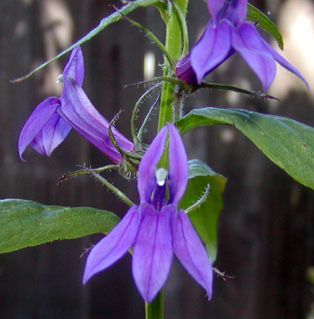 According to the Missouri Botanic Garden web site, Lobelia is "wildly polyphyletic". This means that if you take all descendants of the most recent common ancestor of the lobelias, that group will include more things than just lobelias. Here's a diagram which might represent what's going on. So the group might contain many resupinate species and many nonresupinate species. This creates a familiar puzzle in biology: did the special feature (in this case, resupination) evolve many times independently, or was the special feature lost in several lines, resulting in species without it (that is, non-resupinate). Alstroemerias have more-or-less resupinate leaves.